Our developmental coaching methodology transforms staffing leaders from reactive task masters into coaches who inspire their people and create a culture of self-accountability. The way recruiters & salespeople think and behave is shaped by the conversations they have with their manager and the questions they ask. Managers learn to develop the skills and strategies to empower their people to gain real, genuine buy-in by executing a practical and repeatable coaching framework in which they lead by asking questions vs. telling. Here’s a sample leadership vision for how many staffing leaders manage today vs. their ideal leadership style and focus. What’s your leadership vision? We help staffing managers make the necessary shift in mindset to stop managing and commit to developmental coaching. Managers learn how to guide coaching conversations for team members to self-discover and self-assess ways to leverage strengths, overcome obstacles and continually grow and improve their sales and recruiting effectiveness. The result is a team of self-aware, self-reliant, and empowered recruiters and salespeople who take full ownership for their actions, results and personal growth. By applying our developmental coaching framework, managers are taught how to use data including metrics, activity and pipeline reports to coach and develop their people. 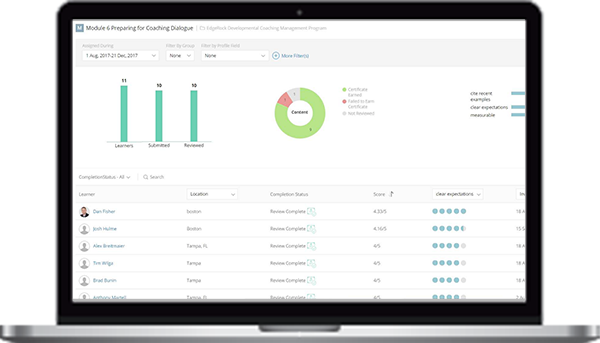 The coaching content, tools and training can be customized around each client’s sales and recruiting process, CRM/ATS system, go-to-market strategy, and messaging. Learn to develop and execute a rhythm of tightly run daily huddles to optimize performance & accountability. Coach to develop healthier pipelines, higher win rates, shorter sales cycles & fewer stuck deals. Learn the questions to ask, how to use customer verifiable outcomes and drive forecasting accuracy. Lead by asking questions to improve performance including sales effectiveness and maximize team members full potential. Learn to tap into the DNA of your recruiters to empower and inspire higher levels of performance. Learn to run a purposeful two-way conversation with mutual goals and framework for developing an action plan. Are 50% of your performers struggling to hit quota and failing to show signs of improvement? Request a leadership development strategy session and learn how to convert your managers into coaches and transform your sales culture.